Upon meeting Dr. Kristin Doyle, O.D., proprietor of Spectacle Gallery, it's clear that she's honed her eye for style. Not only hers—which is feminine and very cool. She also knows what looks just right on her patients and clients as well. Kristin has an impressive résumé to boot. She attended the New England College of Optometry in Boston, Massachusetts, then studied at the Bascom Palmer Eye Institute in Miami. 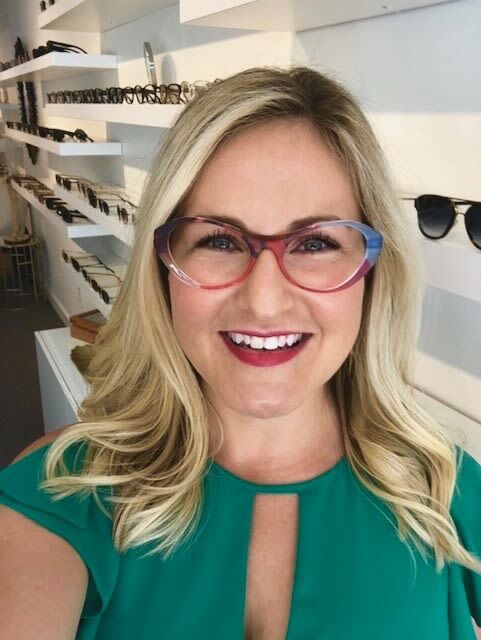 Now, from her Palm Avenue optical boutique, she specializes in comprehensive eye exams, contact lens fittings, and treating eye injuries and eye diseases. A committed Sarasotan since 2010, I caught up with this tastemaker, businesswoman and all around cool girl to learn how she stays vibrantly beautiful. SkinMedica face wash, followed by their TNS Essential Serum, and finally a tinted moisturizer and sunscreen. Oh, and mascara, of course! Water! Keeping hydrated is key for good skin. Pilates helps, too. Yes! Dr. Wright at Hillstrom Wright Plastic Surgery and my esthetician, Justyna at the Met, know my secrets. It is so important to removal all of the day's makeup and the environmental grime that builds up over the course of the day. I am extra diligent around my eyes, as recurrent dry eye is exacerbated by inflamed glands around your eyelids. Trust me, always remove your eye makeup before you go to bed. Your eyes will thank you. After my skin in clean, I apply some SkinMedica moisturizer and some Burt’s Bees chapstick. I do not. As an optometrist, I work in very close proximity to people and I am aware many patients are sensitive to scents. I try not to wear anything that may irritate them. But I do love anything that smells light and fresh. Not washing your face at the end of the day! Take risks, and express whoever they want to be that day—sassy, classy, or just simple with some sunscreen. Pair your look with a fierce pair of shades and you will conquer the world!